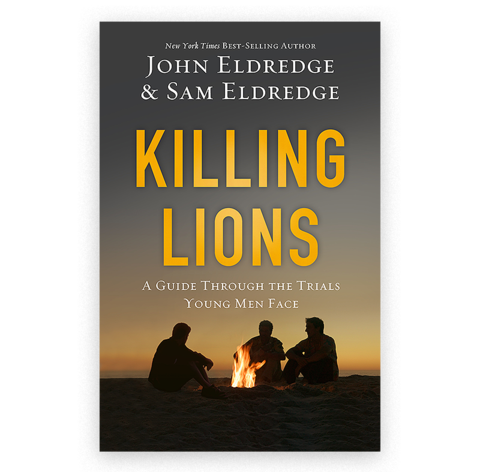 The book “Killing Lions” is a conversation between John and Sam Eldredge about the trials young men face. [John] I’d love to share what thirty years of marriage (and twenty counseling young people) has taught me. But let me begin with a question: What is your greatest fear, as a man? More than anything else, I hate feeling like a fool around a woman. I think most guys do. The sensation afterward is something akin to a personal black hole opening up inside my chest, and I wish it would hurry up and swallow me whole. I once tried showing off on a diving board by doing a double front-flip but ended up hitting the water face-first and giving myself a bloody nose. Almost every guy I know tells stories of spectacular failed attempts at a date or an introduction or a kiss, and while the stories are told in a circle of laughter, every man’s eyes go a little dim as he relives the memory.